Only the spanner delivered with the vehicle should be used to loosen the wheel bolts. Loosen the wheel bolts only about one turn before raising the vehicle with the jack. If the wheel bolt is very tight, you may be able to loosen it by pushing down the end of the spanner carefully with your foot. Hold on to the car for support and take care not to slip. Fit the box spanner over the wheel bolt as far as it will go . Hold the end of the box spanner and turn the wheel bolt one turn anti-clockwise . 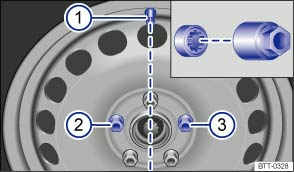 The anti-theft wheel bolt must be bolted into position or ③ on wheels with a wheel cover. The wheel cover can otherwise not be fitted. Take the adapter for anti-theft wheel bolts out of the vehicle tool kit. Insert the adapter into the anti-theft wheel bolt. Push it in as far as it will go. Insert the box spanner into the adapter as far as it will go. The design of the wheel rims and wheel bolts is matched to the factory-installed wheels. If different rims are fitted, the correct wheel bolts with the right length and correctly shaped bolt heads must be used. This ensures that wheels are fitted securely and that the brake system works properly. Wheel bolts from a vehicles of the same model series may, in certain circumstances, not be used. The tightening torque for wheel bolts for steel and alloy wheels is 120 Nm. Have the tightening torque immediately checked with a torque wrench after changing a wheel. If the wheel bolts are corroded and difficult to turn, they must be replaced and the wheel hub threads cleaned before the tightening torque is checked. Never grease or lubricate wheel bolts or the threads of the wheel hub. They could otherwise loosen while the vehicle is in motion, even if the required torque setting is used. Incorrectly tightened wheel bolts can loosen while the vehicle is in motion and cause accidents, serious injury and the loss of control over the vehicle. Use only wheel bolts which belong to the wheel. Never use different wheel bolts. The wheel bolts and threads of the wheel hubs must be clean, free from oil and grease and turn easily. Always use the box spanner placed in the vehicle at the factory to loosen and tighten the wheel bolts. Never remove the bolts on rims with bolted on rings. 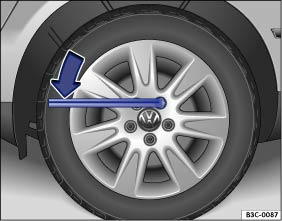 If the tightening torque of the wheel bolts is too low, the wheel bolts and rims could loosen while the vehicle is in motion. If the tightening torque is too high, the wheel bolts and threads could be damaged.